Minuscule representations occur in a variety of contexts in mathematics and physics. They are typically much easier to understand than representations in general, which means they give rise to relatively easy constructions of algebraic objects such as Lie algebras and Weyl groups. This book describes a combinatorial approach to minuscule representations of Lie algebras using the theory of heaps, which for most practical purposes can be thought of as certain labelled partially ordered sets. This leads to uniform constructions of (most) simple Lie algebras over the complex numbers and their associated Weyl groups, and provides a common framework for various applications. The topics studied include Chevalley bases, permutation groups, weight polytopes and finite geometries. Ideal as a reference, this book is also suitable for students with a background in linear and abstract algebra and topology. Each chapter concludes with historical notes, references to the literature and suggestions for further reading. 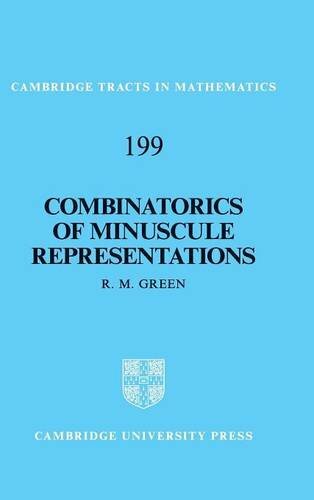 This book introduces minuscule representations and then uses them to study topics in representation theory, algebraic combinatorics and algebraic geometry. Ideal for researchers in these areas, it is also suitable for students with a background in linear and abstract algebra and topology. Each chapter concludes with suggestions for further reading. Richard M. Green is a Professor in the Department of Mathematics at the University of Colorado Boulder. He is the author of about 50 papers, many of which concern the combinatorics of Coxeter groups and related topics.